Our Easter holiday was supposed to have been peppered with walks to get us some mileage in, however, chicken pox once again put paid to our plans. Cate, our daughter, had already been through the illness a couple of weeks before. Ben at first seemed not to be affected, however, just as we were lulled into a false sense of security, he gained some 200 spots overnight. Two weeks’ worth of walking was abruptly abandoned. After days of being cooped up at home, and as the pox subsided and the scabs broke away from their host, it was with great relief that we were finally able to get out and continue our coastal path. We set off back to Allhallows. I have to say that we have not enjoyed our time here. Dominated by a caravan park which has people constantly coming and going, it has an itinerant feel about it. We parked outside the local shops where our walk ended last time and set off south, towards Lower Stoke. Today would be one of our “link walks”, a 5-mile road trek simply to get from one section of the coast to another. 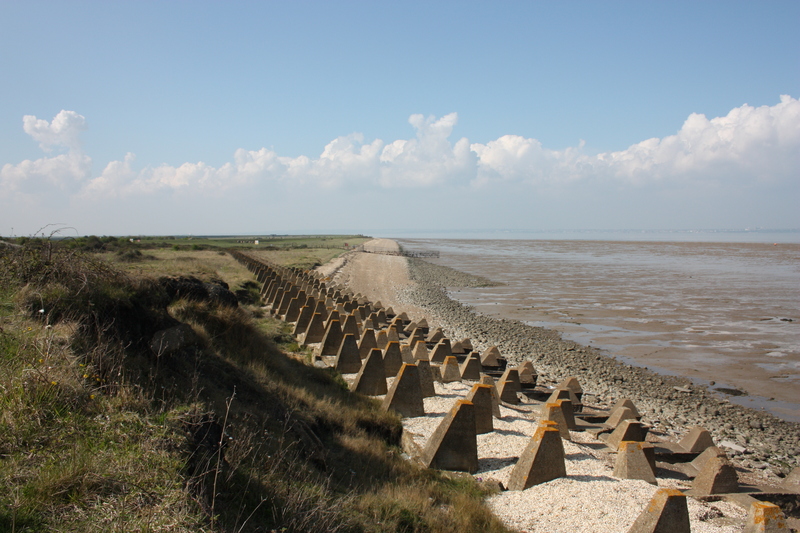 It is impossible to walk from Allhallows to Grain via the coast itself, because a large element of the coastline is taken up by a Ministry of Defence firing range. 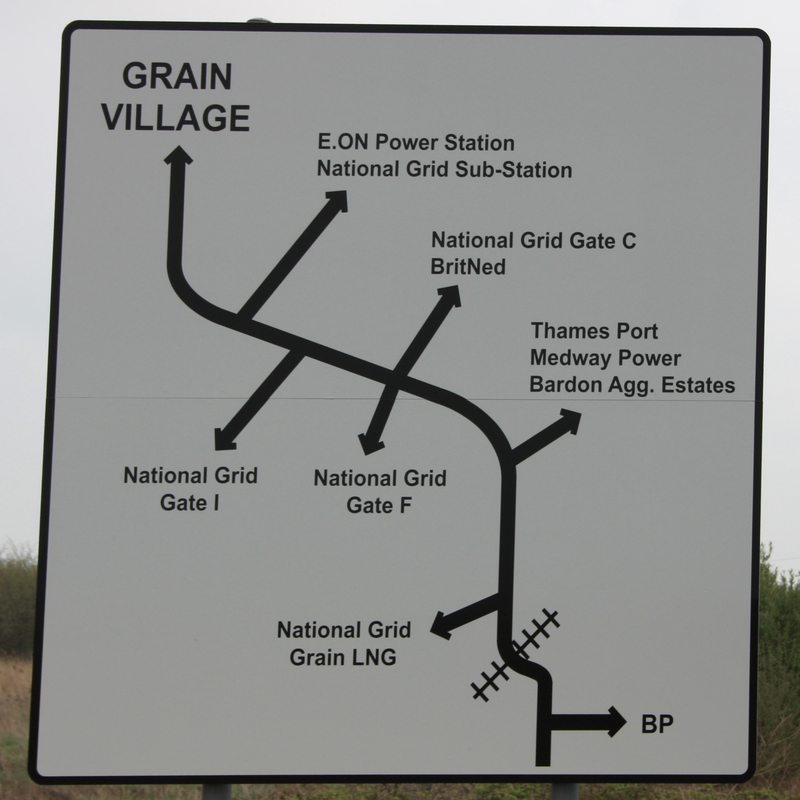 Thus, the only option to get to the Grain section is to head inland and take the one road in to Grain village. Spri ng was in the air. The early cloud was burning off and the entire area seemed to be home to a million birds. Feeling distinctly upbeat, we quickly reached the northern outskirts of Lower Stoke. Rural land filled the gap between Allhallows and Lower Stoke, and the crops were vibrant and flushed with the recent rains. 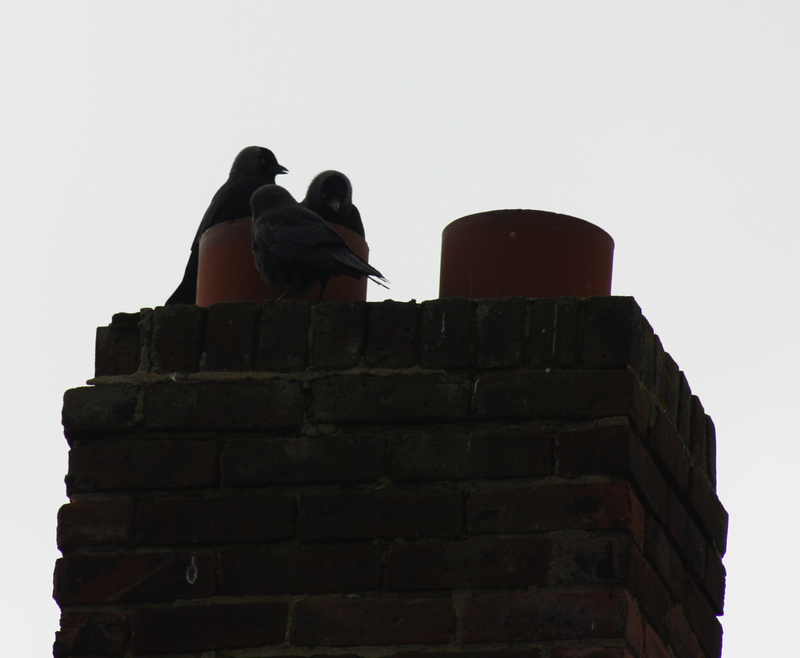 A baby snail crossed our path; birds seemed to be nesting in every house; at one house three birds were noisily going about their business in a chimneypot where they were clearly nesting. We found Lower Stoke a far more attractive village when compared to Allhallows. For a road walk, this first section was admittedly not a bad one. But then we hit the A228. This is Grain Road, running east from the bottom of Lower Stoke Village and into the Grain industrial complex. From there it bends round to the northeast, running alongside Grain Power Station, eventually reaching Grain village. It is a busy road with no pavement. About half of the traffic using it comprises lorries heading to or from the industrial area. We headed for the better looking verge and, heads down, got on with things. There was little of interest here, save for a microlight practising rolling landings at the grass runway just to the south of us. 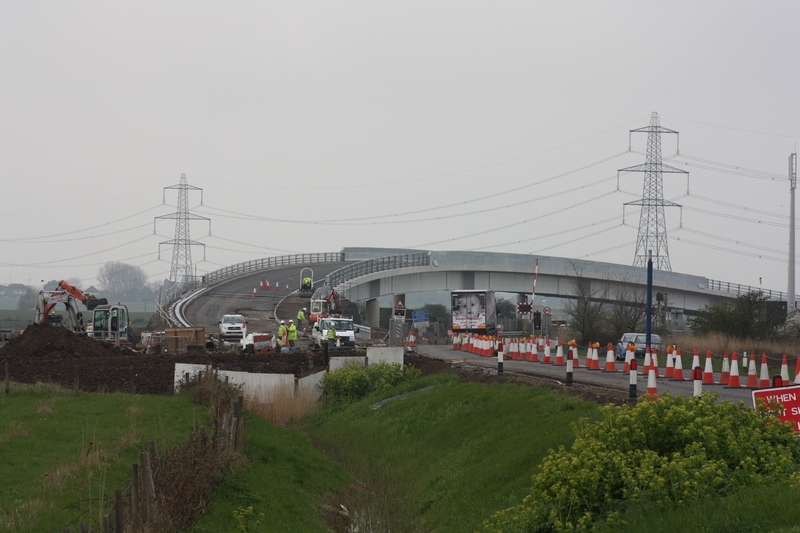 We soon approached some roadworks; a bridge was being built to bypass a railway line and level crossing (in the interests of safety so a construction sign said). As we approached the area, one of the workmen waved us over. In a tone I immediately took a disliking to, he told us that we were walking on an extremely dangerous section of road, and asked where we were headed. This seemed to me to be a bit of a strange question, as the road only led to one destination. I told him we were headed for Grain. He repeated that this was an extremely dangerous piece of road, and went on to say that 14 people had been killed here. He said that such was the danger associated with this stretch of road that he was required to wear both a high-visibility jacket and trousers in order just to work there (I wondered why his colleagues all only wore hi-viz jackets and not trousers, but decided not to ask). He told us that he was going to have to put us in the back of his truck and drive us over the new bridge to the other side, where he would let us out again to continue on our way. He could not allow us to carry on walking on the verge of the road. It must be appreciated that to someone who has decided to walk the entire coast of Britain, the prospect of skipping a couple of hundred yards in the back of a truck is not a happy one. “But isn’t this public highway?” I asked. He admitted that it was, and anticipating that I was about to say that we therefore had every right to walk along it, told me in front of my children and in a manner I took immediate offence to that if I wanted to risk the life of my children by continuing on foot then that was up to me, but his offer of safe carriage was there if we wanted it. My wife and children, taking his representations very seriously, were all up for jumping into a stranger’s van and going off with him. I was not. When my wife realised that I was going to leave her to her fate with this man, she reluctantly changed her mind. I thanked the workman for his kind offer and he left us, clearly unimpressed with my attitude which made me even more angry. We continued on, mindful of the traffic, but this stretch of road was nowhere near as bad as the one we had navigated between Mucking and Linton many weeks ago. On we went, finally getting the outskirts of the industrial area, where a large sign clearly indicated that all turnings off from the road were to major heavy industrial installations, whilst Grain village lay directly ahead. Each industrial site was fenced off and guarded by a gatehouse. Huge numbers of lorries pulled in and out, and a goods train with some 30-odd containers also rumbled in. It was not a particularly pleasant area and although we stopped for some lunch on the grass verge, we were keen to move on. We followed the road round to the north, and walked by Grain Power Station. Grain Power Station is a beautiful beast of a building. 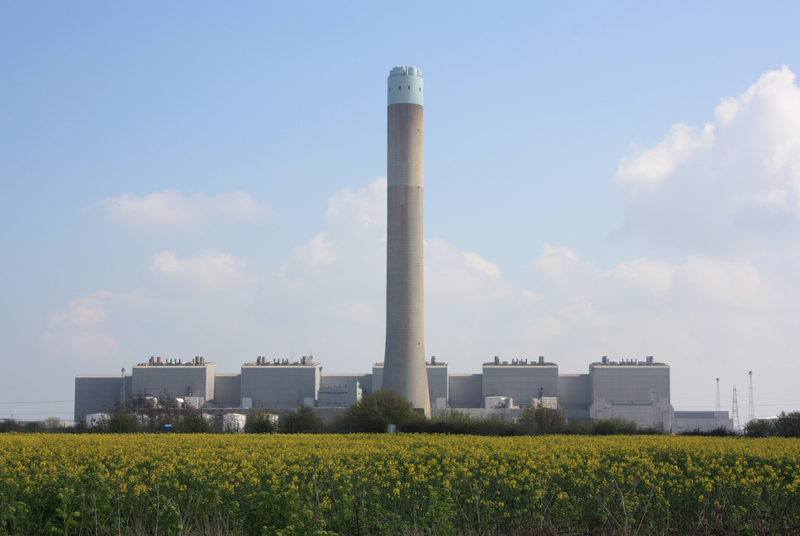 It was originally built in the late 1970’s as an oil-fired station, though along with many other older power stations, this original part now has to close in 2015. 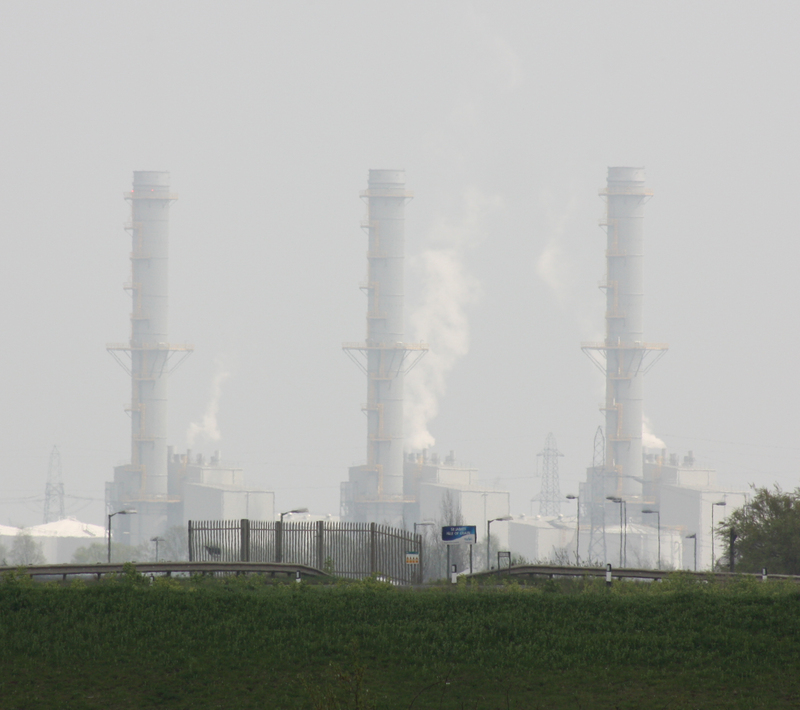 In 2010 three gas turbines were completed, increasing efficiency whilst reducing carbon emissions. They also supply waste heat in the form of hot water to the National Grid liquified natural gas terminal across the road. Once through the industrial complex, it was only a short walk into Grain itself. Its name dates back to 1100 and comes from the word “Grean”, meaning “gravelly sandy ground”. Grain used to be an island, and indeed the area is still known as the Isle of Grain. However, it silted up long ago and is now no longer an island, but part of the mainland. The High Street of Grain, which only contains a couple of shops and a pub, runs until it ends at the coast. Here we found a welcome man-made shingle beach. The mudflats stretched away before us, and in the distance we could see the Santa Clara, the third ship of the distinctive red Hamburg Süd line we have seen during our walks. It was just before we got to this beach that we picked up a companion. 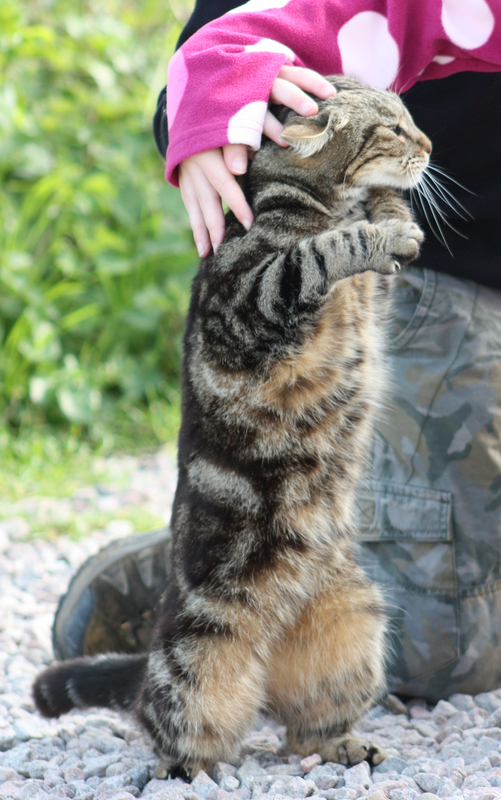 A young cat decided to join us and stayed with us for a quarter of a mile, before slinking off to explore a gap in some rocks. We weren’t able to go much further. We found a short route which heads north along the coast, but this ended at a fence. Notices proclaimed a live firing range on the other side; we had to turn back. Just before the fence, however, we found a beautiful area of shingle beach, lined with sea defences looking like sentinels, or perhaps gravestones, which faded away into the long grasses. In fact, when we went down to this beach, we found it was not shingle at all, but thousands upon thousands of sea shells. We turned back and were surprised to find the cat waiting for us exactly where it had left us. 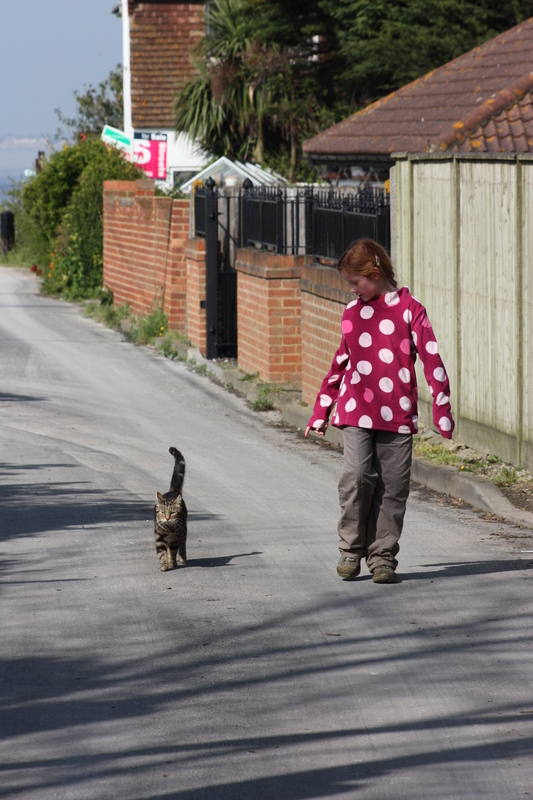 It walked another quarter of a mile with us, back to our car. 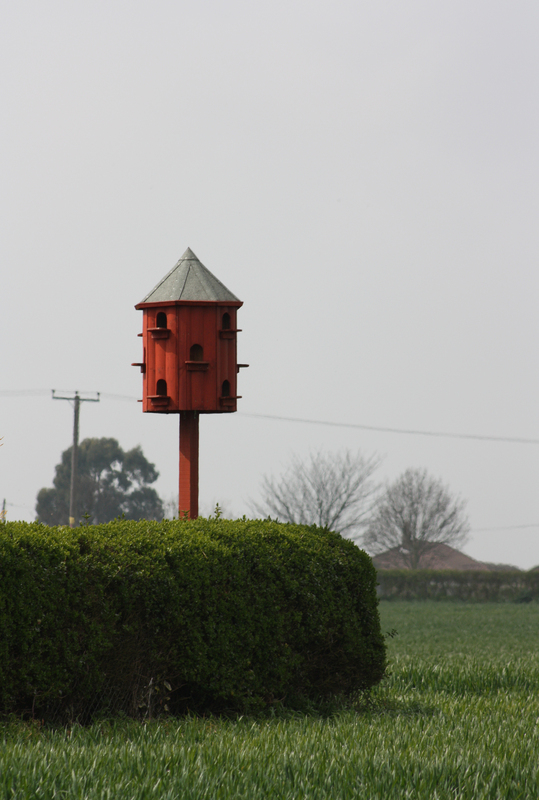 This entry was posted in Kent and tagged coast, Grain, Hoo Peninsula, Isle of Grain, Kent, Lower Stoke, travel, walking. Bookmark the permalink. Glad you survived the traffic section & the over zealous workman. Let me know when you get to the Isle of Sheppey & I’ll try to join you. Mark – very soon I hope! We finished off Grain today which was an amazing walk, including a trip out to Grain Tower at low tide. 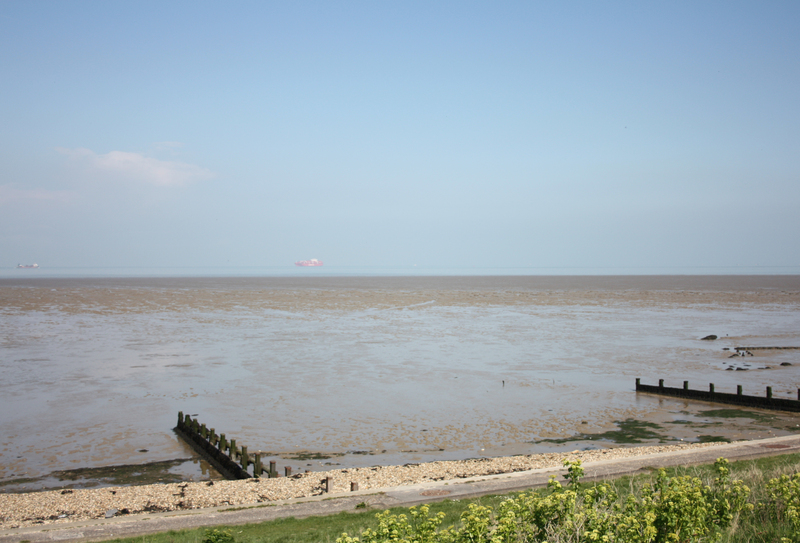 We were staring across to the Sheppey bridge wondering when we’d get there. I’ll certainly let you know and will look forward to putting in a few more miles with you!